An Excel file to assist in laying out addresses and/or variables to control the serial ports on an IC695CMM002 or CMM004 module. It is incomplete in that this version only details the use variables used when the ports are configured as "Serial I/O" or the ASCII protocol. This little utility will figure out the proper parameters for an SNP serial connection on a GEIP Series 90 PLC. It can then be used to Clear all faults in the CPU and put the CPU into RUN mode. You can use the standard serial cable that one would use to program the PLC or build one following the diagram included. It is simple, easy and just may come in handy some day. One problem, I can not get it to run in Windows 7, 64bit. 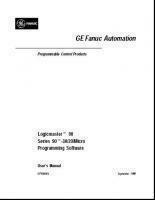 GE Fanuc Series Six ASCII BASIC (ABM) Manual. A coprocessor module with a Z80 CPU, 64K RAM, and a BASIC interpreter. A Commodore 64 for your PLC! This wizard will assist in using the GE Fanuc COMM_REQ Function Block. Series Five I/O Module specs and wiring. Series Five User's manual. This is zipped because the pdf file is 49 meg. 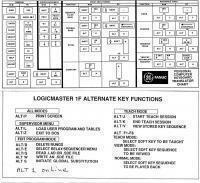 User's manual for Logicmaster Five programming software. VB application including source code for SNP communications. User's manual for the old Series Six Plus PLC. 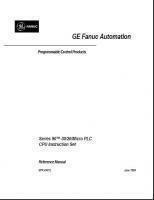 This manual is not available from the GE Fanuc website. This is a scan of the Keyboard Map from the back of the Seris 1 Manual. Just what the title says. The Series One Plus is the same animal as the TI305 and the Automation Direct DL305. 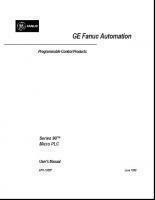 Hardware and programming manual for the old GE Fanuc Series One Junior. This was a Koyo product that was never marketed by TI after they took over the product line nor by Koyo after they started PLC Direct (later Automation Direct).